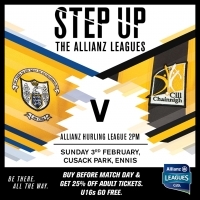 All roads lead to Ennis on Sunday when Kilkenny will take on the Clare in an eagerly awaited Allianz NHL round 2 fixture. Kilkenny started their league campaign with a win over Cork, while Clare lost to Tipperary in their opener. Both sides will be aiming to claim the valuable points from Sunday's clash. 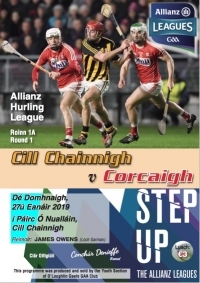 Sunday's game has a throw-in time of 2pm, we advise all patrons to pre-purchase tickets at participating Centra and Supervalu stores, cost €15. On the day at the ground tickets will be Adults €20, Students/OAP's €15 (valid student ID required) and U-16 Free. Please note online tickets sale are suspended three days prior to the game, Centra and Supervalu tickets are on sale until Saturday night. Click below re Car parking for Cusack Park. Kilkenny got their defence of the Allianz league title off to a flyer in Nowlan Park today, running out 2-18 to 0-17 winners over Cork. In freezing conditions, Kilkenny lead for much of the game but two goals, one for Billy Ryan and the second for Richie Leahy proved crucial in securing the win. The Kilkenny team that will take on Cork on Sunday Jan 27th has been named. The game is fixed for Nowlan Park on Sunday at 2pm. Pre-purchase tickets at participating Centra and Supervalu stores until Saturday night. Online sales have been suspended at this stage. 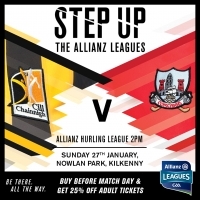 Kilkenny will commence their Allianz NHL campaign with a home game versus Cork on January 27th in Nowlan Park. This game promises to be a cracker, both sides will be hoping to start the league with a win. The game has a throw-in time of 2pm, pre-purchase tickets are on sale at participating Centra and Supervalu stores, cost €15. On the day at the ground tickets will be Adults €20, Students/OAP's €15 (valid student ID required) and U-16 Free. All season ticket holders will be accomadated at the Ardán de Grás (Turnstile No’s 14-17, off the Hebron Road) side of the ground only. Kilkenny claimed the Allianz League title today against near neighbours Tipperary, following a commanding second half performance. Kilkenny were two points down at the break following an uneventful first half, but they saved the best for the second half where they powered to a six point victory to claim their 18th title.